“How do you set up your space for in-person readings? Thanks for your question, JE! I keep things simple here. There’s a wide table that can accommodate several cards, if necessary. I don’t use a tablecloth because it bothers me when the cloth bunches up and slides around as we lay out cards, pick them up to look at them, etc. Also, the plain black table surface provides a backdrop that makes the tarot images easy to see. I don’t like doo-dads on the table (statues, crystals ,etc.) because, to me, they distract us from the tarot experience. However, there are sculptures, drums, art prints, and books in the room that make it feel personal and special. Even though I’m a person who enjoys music, I prefer the room to be quiet during a consultation so the client and I can hear one another clearly. When the client arrives, there are three or four decks on the table from which they can choose (more about that in another article), a copy of the spread(s) that we’ll be using, and a cup of tea or glass of water for each of us (our conversation will make us thirsty). I also have blank paper and pens so I can take notes as we go along and so that the client can take a few notes if s/he chooses. We sit on a long sofa side-by-side so we can see the tarot pictures from the same angle and to remember that we are co-creators of the tarot encounter rather than me acting like an “expert” who talks at them from the other side of the desk. There’s a large glass door on the other side of the table, giving us a view of trees, plants, and sunshine — it’s lovely to be able to see the natural world during the session. In a nutshell, we sit together on a comfortable seat by a spacious table that holds cards, notes, and beverages in a pleasant, welcoming space that has a view of the back yard. Easy! I hope that answers your question, JE. Image: Detail from the Ten of Flame Songs from the Songs for the Journey Home Tarot by Catherine Cook and Dwariko von Sommaruga. Tarot by Phone and Skype: It Works! I recently posted an invitation on Facebook for people to write to me about the tools and processes I use in my work, especially (but not only) related to the tarot and to circle process. Here’s the first note I received, followed by my response. 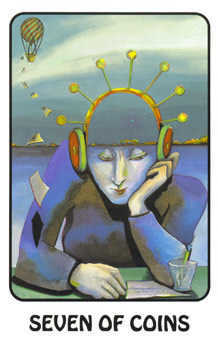 I’m curious about long-distance tarot readings by phone or Skype. Do they work? How do they work? Are they as effective? Doesn’t the person you’re reading for need to touch the cards to get their energy into them? Thanks for answering these questions. Thank you for your note, JD! I do many tarot consultations by Skype and by telephone. For me, a tarot session is simply a form of conversation, so any mode of holding a conversation with another person will “work”. My way of using the tarot with other people is very interactive — the client asks questions, I ask questions, the client makes statements, I make statements, etc. — whether in person, by phone, or on Skype. There’s a lot of mutual feedback, so as long as we can hear one another, the other person and I can talk about the card images and concepts and relate them to her/his topic of exploration. It’s less about energy and more about having a clear intention and staying on track with the topic and questions. Some people have their own tarot deck, so they’ll pick cards on their end and I’ll match them up with the same deck on my end. Other people don’t have a tarot deck, so I’ll simply pick cards here and show them the pictures if we’re on Skype or briefly describe them to the client if we’re on the phone. The main thing to remember is that we’re holding a conversation that helps him/her tap into his/her inner wisdom, so there’s no need for a tarot client to be in the room with me; s/he can be anywhere in the world and have a helpful, constructive tarot encounter. I hope that answers your questions, JD. Please feel free to keep in touch! I’m playing the organ in a large brick church building — an improvisation on “Tantum ergo sacramentum” using whole-tone clusters. As I play, I’m aware that the walls are now covered in Marseille-style tarot cards. Some sections are in suits or majors and other sections are entire decks. Sometimes they’re sideways to fit the wall and at other times they’re upright and filling an entire space. This sight inspires me to play even more beautifully and creatively. It feels so good. I drew a card from the CBD Tarot de Marseille (by Yoav Ben-Dov) to respond to, “What is the principle message of this dream?” My own take on the Nine of Coins is the amalgamation of my various skills and tools into a creative and useable whole. Yoav’s suggestion, in his book, is that being a nonconformist or carrying out an unconventional idea may hold the key to future advancement. When I blend his interpretation with mine, the dream’s principle message seems to be that amalgamating my various skills and tools in unconventional, nonconformist ways can help me to advance my work and life into a creative whole that is useful to me and those around me. Beautiful!